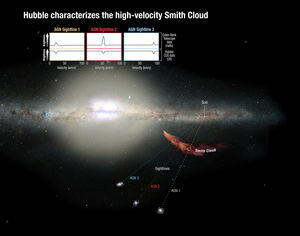 Since astronomers discovered the Smith Cloud, a giant gas cloud plummeting toward the Milky Way, they have been unable to determine its composition, which would hold clues as to its origin. 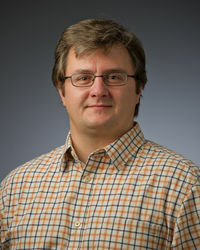 University of Notre Dame astrophysicist Nicolas Lehner and his collaborators have now determined that the cloud contains elements similar to our sun, which means the cloud originated in the Milky Way’s outer edges and not in intergalactic space as some have speculated. The Smith Cloud, discovered in the 1960s, is the only high-velocity cloud in the galaxy for which its orbit is well-determined, thanks in particular to studies with radio telescopes like the Green Bank Telescope (GBT). The starless gas cloud is traveling at nearly 700,000 miles per hour and is expected to crash into the Milky Way disk in 30 million years. If it were visible, the Smith Cloud would have an apparent size of about 30 times the diameter of the moon from tip to tail. Astronomers long thought that the Smith Cloud might be some starless galaxy or gas falling into the Milky Way from intergalactic space. If that were the case, the cloud composition would be mainly hydrogen and helium, not the heavier elements made by stars. The team used the Hubble Space Telescope to determine for the first time the amount of heavier elements relative to hydrogen in the Smith Cloud. Using Hubble’s Cosmic Origins Spectrograph, the researchers observed the ultraviolet light from the bright cores of three active galaxies that reside billions of light-years beyond the cloud. The Smith Cloud absorbs some of its light in very small wavelength range, and by measuring the dip in brightness of these galaxies behind the cloud, the chemical makeup of the cloud can be estimated. The researchers looked specifically for absorption from the sulfur element, which is a good gauge of how many heavier elements reside in the cloud. “By measuring sulfur, you can learn how enriched in sulfur atoms the cloud is compared to the Sun,” said team leader Andrew Fox of the Space Telescope Science Institute in Baltimore. The team then compared Hubble’s sulfur measurements to hydrogen measurements made by the GBT. The astronomers found that the Smith Cloud is as rich in sulfur as the Milky Way’s outer disk, a region about 40,000 light-years from the galaxy’s center and about 15,000 light-years farther out than our sun and solar system are. This means that it was polluted by material from stars. This would not happen if it were pristine hydrogen from outside the galaxy. 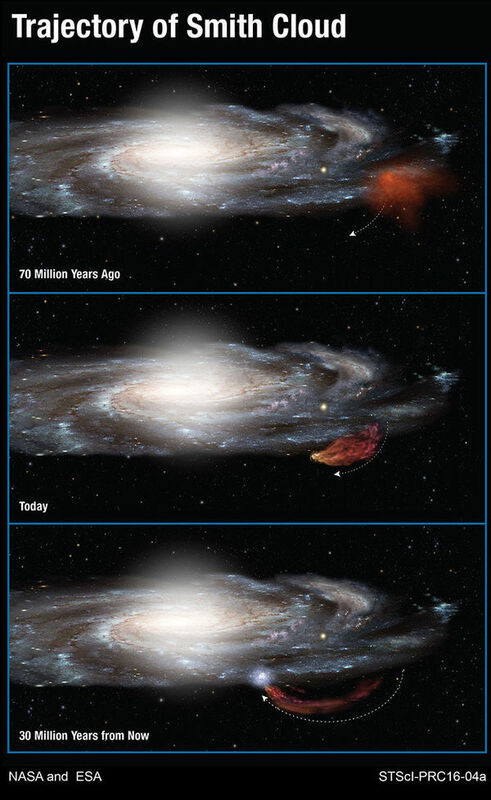 Instead, the cloud appears to have had an intimate relationship with the Milky Way, but was somehow ejected from the outer Milky Way disk about 70 million years ago and is now boomeranging back onto its disk. Astronomers believe the Smith Cloud, has enough gas to generate two million suns when it eventually hits the Milky Way disk. 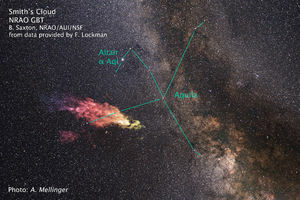 “We have found several massive gas clouds in the Milky Way halo that may serve as future fuel for star formation in its disk, but, for most of them, their origins remain a mystery. The Smith Cloud is certainly one of the best examples that shows that recycled gas is an important mechanism in the evolution of galaxies,” said Lehner. The study, titled “On the Metallicity and Origin of the Smith High-velocity Cloud,” was published this month in the Astrophysical Journal Letters. Fox, Lehner and co-author Jay Lockman of the National Radio Astronomy Observatory discussed the discovery during the Space Telescope Science Institute Hubble Hangout on Thursday (Jan. 28). More information is available here. Originally published by Gene Stowe at news.nd.edu on January 28, 2016.